Knopf Books for Young Readers, 9781524764470, 48pp. "Cats of Instagram" meets National Geographic in this hilarious picture book about nature's cutest weirdos from the author of Pink Is for Blobfish! The Internet pretty much runs on cute animal photos, but "cute" is so much more than clickbait kittens and insta-pups. Cute is for feathery-gilled axolotls (pronounced: ax-uh-LOT-ulz), shy pygmy hippos, poisonous blue dragons, and armored pangolins. All of these animals are cute, but they've also adapted remarkable ways to survive in their unique environments. 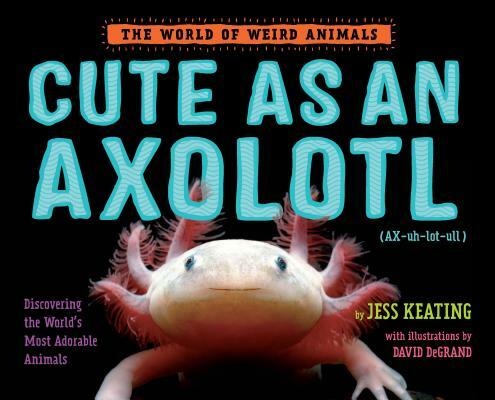 With her signature blend of humor and zoological know-how, Pink Is for Blobfish author Jess Keating shows how cute animals can be more than just a pretty face in this latest installment of the World of Weird Animals. Jess Keating is a zoologist-turned-author who writes with the sort of wisdom you can only get from multiple crocodile bites and skunk sprays. Jess has been making up stories for as long as she can remember, and at the age of eight, she even started a library in her room (mainly so she could charge her brother late fees). She lives with her husband in Ontario, Canada, where she is hard at work on her next book in the World of Weird Animals series.